He is risen indeed. Jesus came to earth; he gave his life and he rose from the dead. It was because of his great love for us. Although much snow has disappeared this week there are not many signs of life in my garden, definitely no tulips yet. I will look forward to the real ones while I create gardens with the stamped ones! 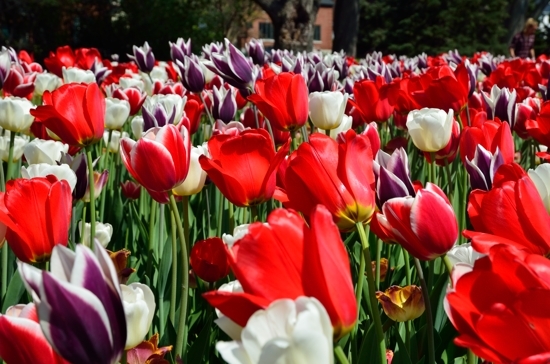 Here in Ottawa we enjoy the Tulip Festival each May and in Canberra where I lived for many years, Floriade is held each September. 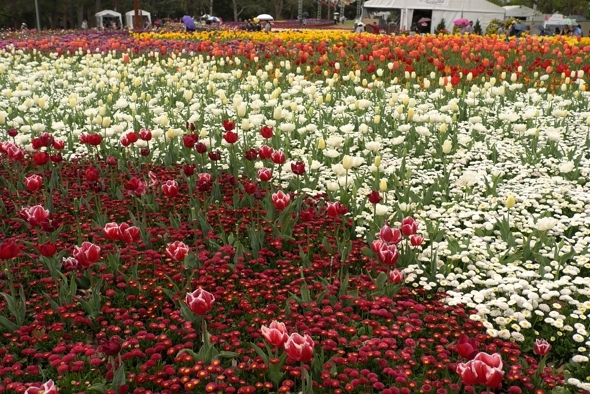 Both festivals feature massed flowers some in blocks of colour, others mixed like confetti. 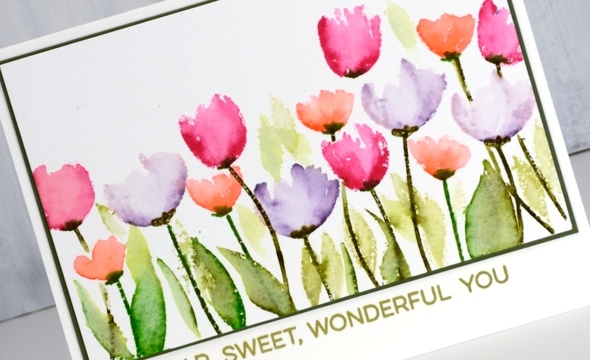 It was the blocks of coloured tulips that inspired this card. I’ve added a photo from each festival below. I began by taping hot pressed watercolour paper to my glass mat and spritzing water over the whole panel. 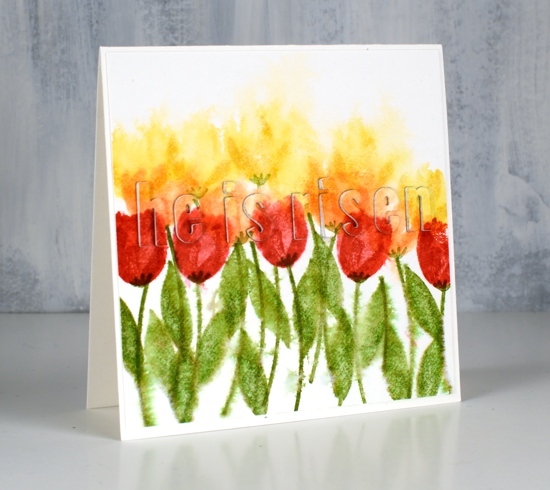 First I stamped the yellow tulips from MFT’s ‘painted prints’ set in Catherine Pooler’s shea butter ink. 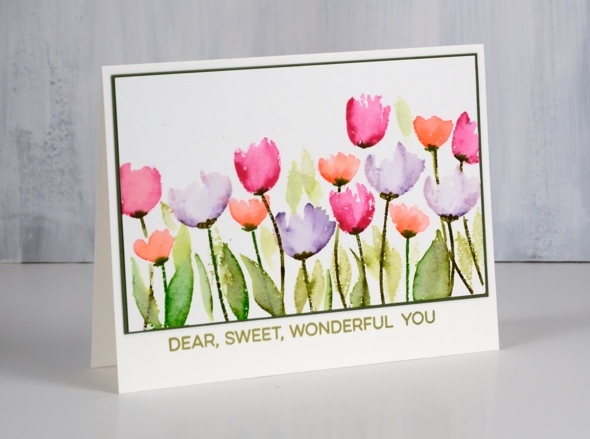 Because the paper was wet the ink bled into the surrounding area but still hinted at tulips shapes especially when I stamped the second layer of the tulip in the same colour. 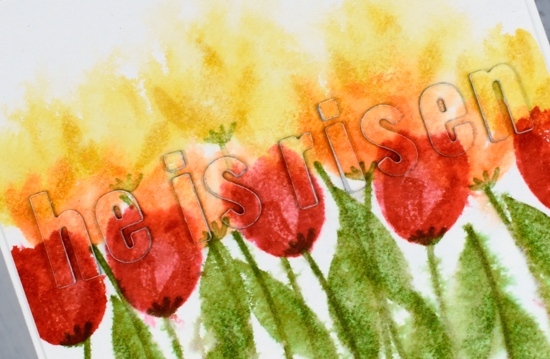 I chose a different tulip and stamped a row in CP bellini ink underneath and finally CP ‘rockin robin’ ink for the foreground row. The paper was slowly drying as I did this so the foreground tulips, stems and leaves were more distinct than the background (first) ones. I die cut my words from the painted panel and popped them up on three layers of die-cut white cardstock letters. I put stick-it adhesive on the back of the cardstock before I cut all my little letters but forgot to put it on the back of the painted panel so I used a Lawn Fawn glue pen. The marvy jewel picker also came in handy as did some teeny tweezers; fiddly jobs like small stacked die cut letters tend to take me a while but I am finding it easier using tools rather than fumbling with my fingers. Jennifer McGuire did a fabulous video with stacked letters a couple of weeks ago and referred to this technique as the ‘eclipse’ technique. I think that sounds rather classy and clever so I will now use that terminology too. Here is the real thing, above in Canberra, below in Ottawa. I did some paint pouring yesterday with some friends who had done it before and had skills they were willing to share. I was excited to go and try it but fairly certain it would just be a fun experiment rather than a new passion. Not so sure anymore!! It is very addictive, a bit like alcohol inks and the way they keep moving and doing magical things. I did several pours on heavy yupo and a couple of little canvases. They take a while to dry so I have turned only one into a card so far. I won’t go into detail about the technique or supplies; I’m too much of a newbie. If you want to learn about paint pouring then look up Myriam’s Nature on youtube and prepare to give up the rest of your day being mesmerized by her beautiful panels. My base for this design was white paint then I dipped threads into blue paint and gold paint and dragged them across the panel to create these pretty patterns. 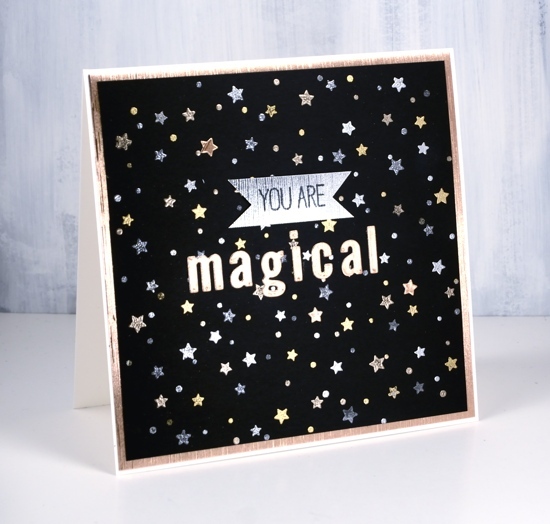 I’ve turned this panel into a thank you card with a Penny Black die and a MFT sentiment. I am so happy to be sending out thank yous to people who have donated to my Dressember campaign raising money to help fight human trafficking. 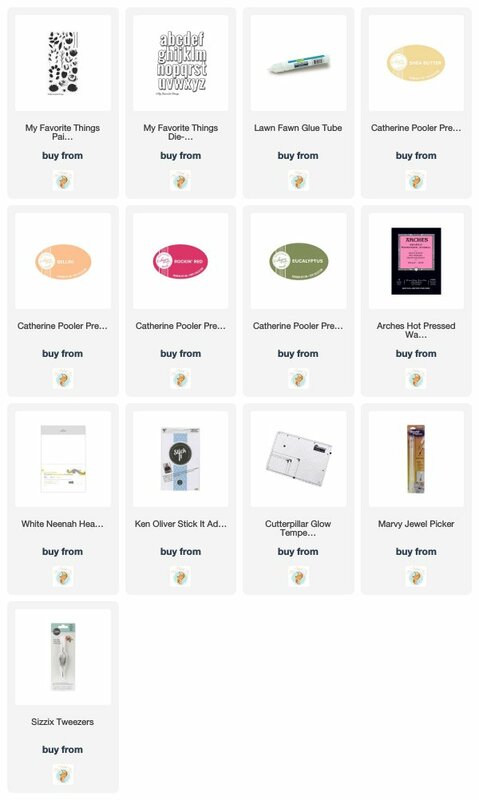 I am excited that so many of my donations so far have come from people I know through card making, some I’ve met at classes, others read my blog. It is a privilege to be part of such a caring, giving community. 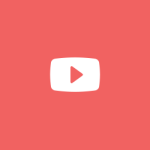 Thank you for getting involved. If you would like to donate please visit my campaign page. 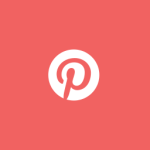 If you would like to see if I’ve been wearing the dresses each day I’m posting on Pinterest and Instagram. I will show you more of my paint pouring panels in future posts. Thanks for dropping by. 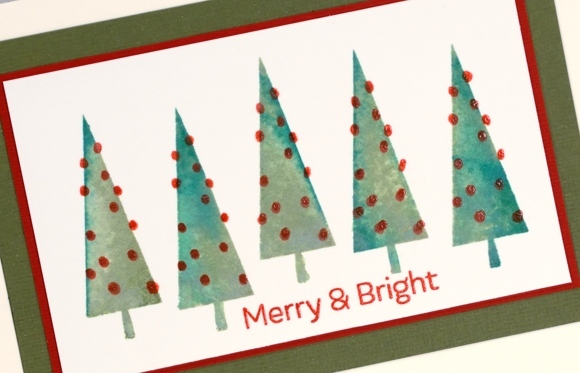 Today’s cards are made with a cute set from My Favorite Things and some oxide inks. I didn’t set out to make watercolour cards but it seems I just can’t help it! 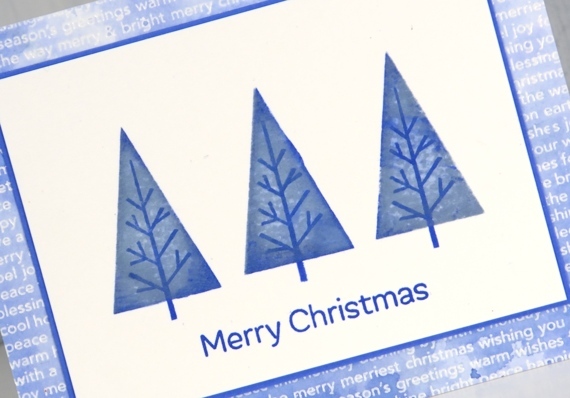 I stamped the little tree skeleton stamp in versamark then embossed in clear powder. Next I inked the triangle tree stamp in peeled paint and peacock feathers oxide inks and stamped over the top of the skeletons. Then, not willing to leave the trees, I gave them a watercolour look by blending the two colours within the triangle with water. 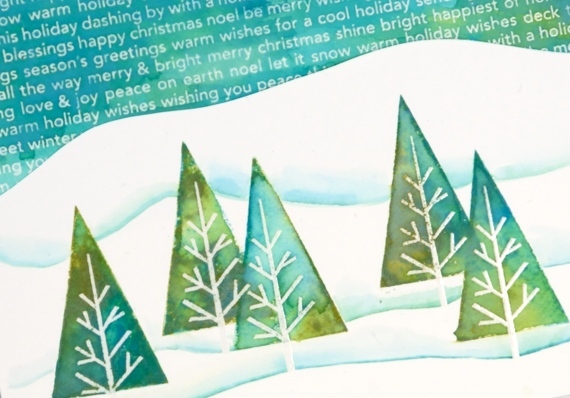 I used the same two inks to create a blended sky over the embossed MFT Christmas background stamp. I painted the snow banks in amongst the trees by picking up ink off my glass mat. 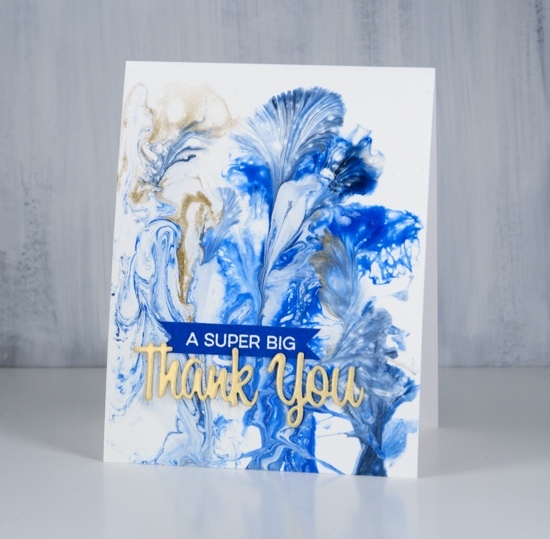 I followed a similar process to create this blue card. 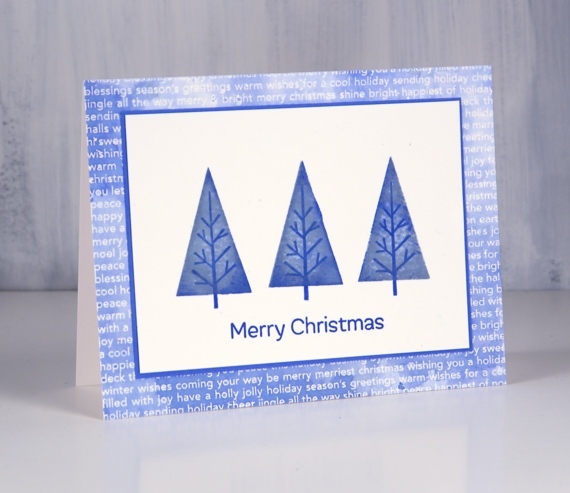 I inked the triangles with blue print sketch and stormy sky distress oxide inks, blended them and stamped the tree skeleton over the top with blueprint sketch. The background is once again embossed then swiped through some diluted blue print sketch and stormy sky distress oxide ink on my glass mat. 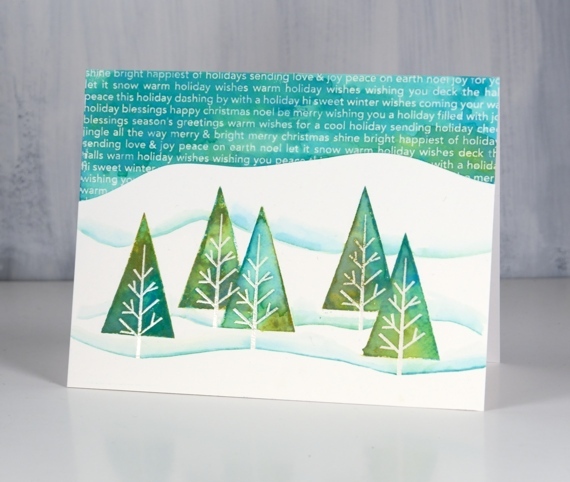 The final card is a very simple design but again I started with two tone blended trees (a different tree stamp). This time my colours were bundled sage and lucky clover oxide inks. Once the trees were dry I stamped the dot stamp over the top with candied apple oxide ink and added a sentiment in the same ink. I decided to make the sentiment shiny by embossing in clear powder, then restamped all the dots so I could emboss them too. 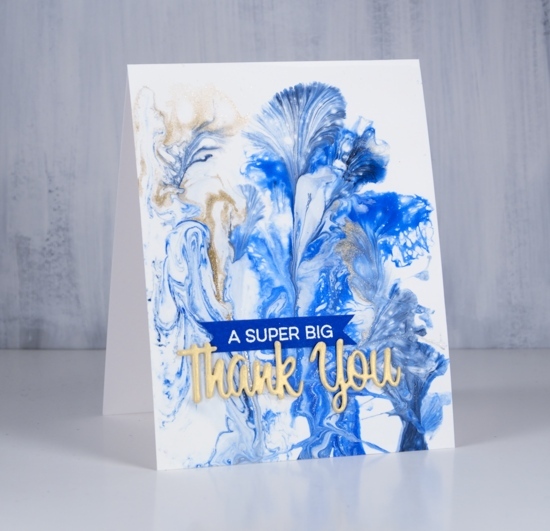 These cards are a bit different from my usual style but reminded me how much fun can be had with the oxide inks. You absolutely made my day on Monday by sharing what you are thankful for. 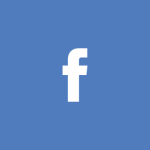 I was so encouraged reading your comments. 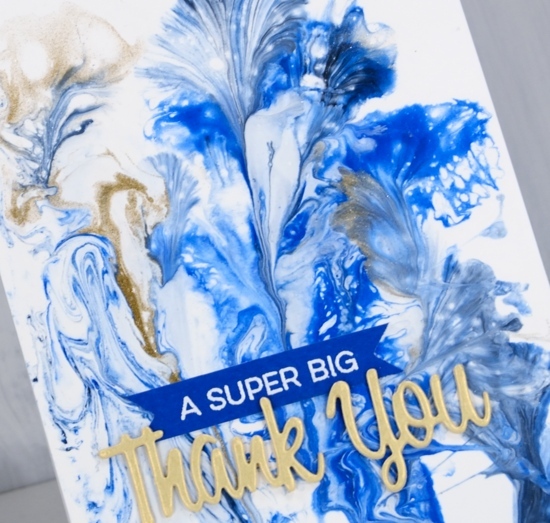 I hope you are still counting your blessings because the Foiled Fox and I are continuing our gratitude week and giveaways with a couple more cards today. You can enter on each of the posts this week for more chances to win; just tell us something different that you are thankful for on each day. The Foiled Fox is giving away a $25 gift certificate to three of our readers who leave a comment here on my blog and/or on the Foiled Fox blog telling us something they are grateful for. It does not have to be related to art and craft at all. 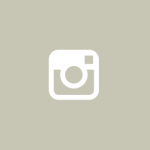 You have until the end of Friday, October 5th to add a comment to any of this week’s gratitude posts. We will randomly choose a winner from each gratitude post and announce them on Tuesday, October 9th. 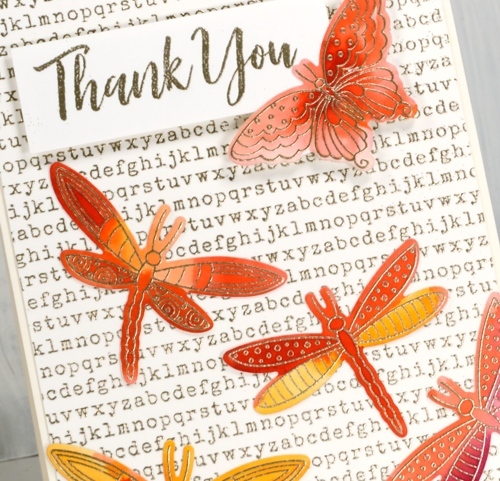 These sweet dragonflies and butterfly are from My Favorite Things; it’s a set called Fluttering Friends. I like the fact that there are more dragonflies than butterflies in this collection; often it is the other way round. 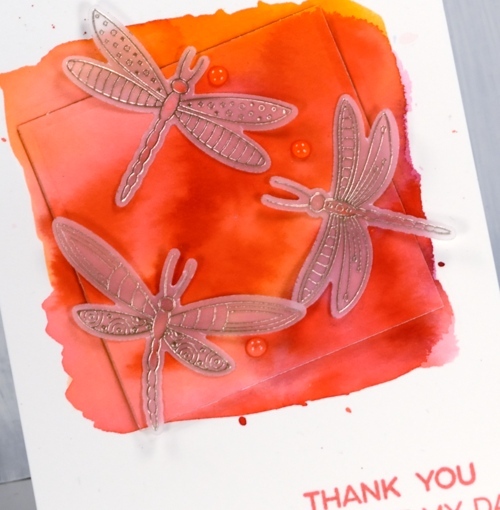 For this first card I embossed the dragonflies on vellum in platinum embossing powder then cut them out using the co-ordinating die set. I painted a rough square on hot pressed watercolour paper with Peerless transparent watercolours. I love these watercolours; the colours are vibrant and the blending is beautiful. I then die-cut a square from the panel and from some adhesive backed foam and popped up my square as a platform for the dragonflies. 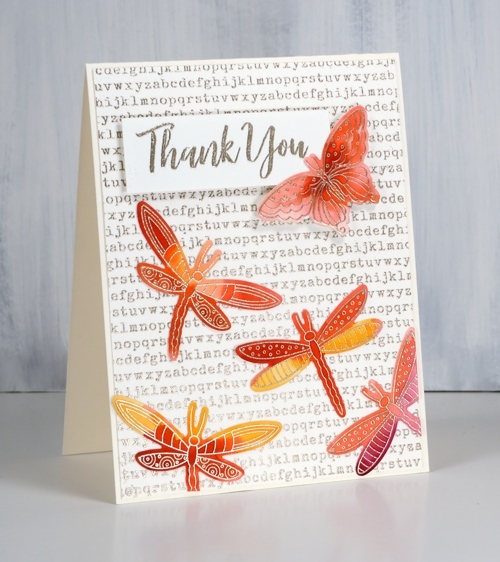 I even remembered my nuvo drops and made some clear droplets beside the dragon flies, then finished the card with a sentiment from the MFT ‘all about you’ set. 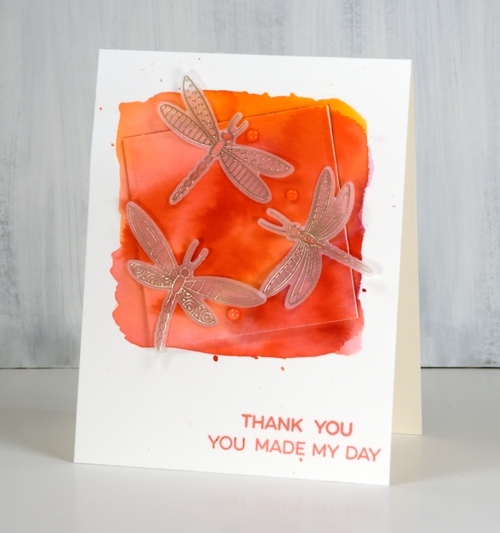 I kept my colours similar for the second card but featured painted dragonflies and butterfly instead of a painted background. Once again I used peerless paints, blending oranges, yellows and pinks. 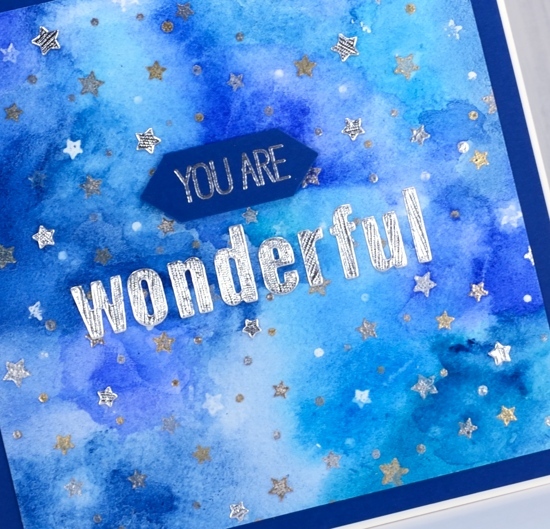 The embossing is all in platinum powder and the sentiment this time is from ‘brushstroke expressions’ popped up over a ‘typewriter text’ background. I’ll wrap up this post by telling you another thing I am thankful for, and it is something many of you mentioned on Monday, my dear family both near and far. 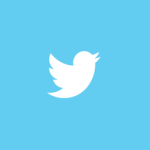 I have a wonderful family, four of them here in Canada and all the rest on the other side of the world in Australia. 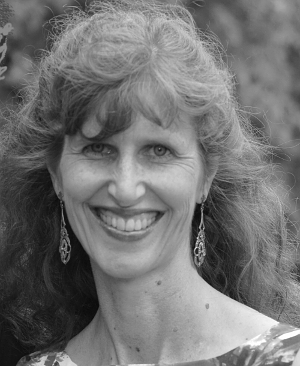 Thanks for dropping in today; I hope you are having a delightful day! When I was working with the painted prints set a few weeks back I kept experimenting and came up with a process that uses only one of the stamps in each co-ordinated set of 2 or 3 layered stamps. The stamps are designed to work in 2’s or 3’s; you usually stamp the larger stamp first then the smaller ones over the top. Instead for these cards I worked with the second stamp of each layering combo. 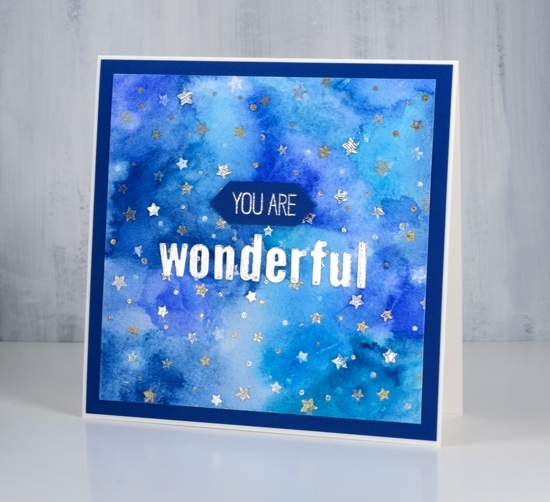 I stamped in distress ink and used a brush and water to blend the stamping into a fuller shape. This gave me light and darker shading on each flower. 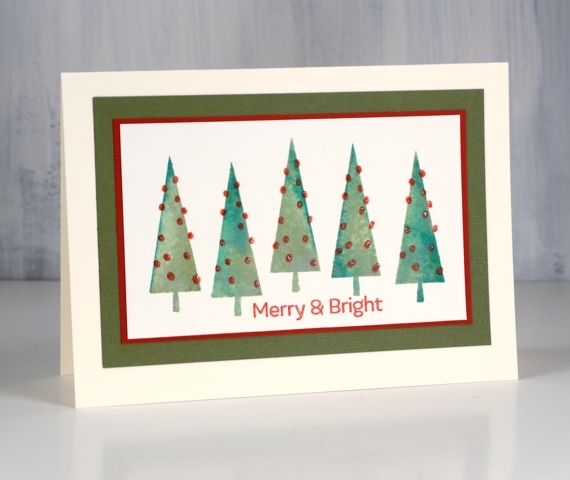 I stamped and restamped the leaves and stems to get dark, medium and light green tones. A little spritz of water over the leaves made the colour bleed into the paper a bit more then I finished it off with some green splatter. 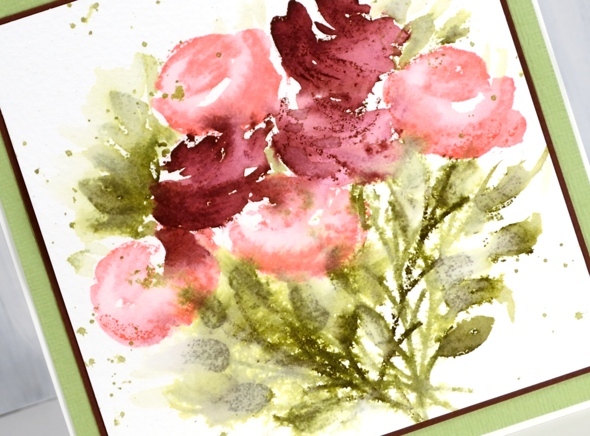 The inks used in the card above were worn lipstick, aged mahogany, forest moss and shabby shutters. 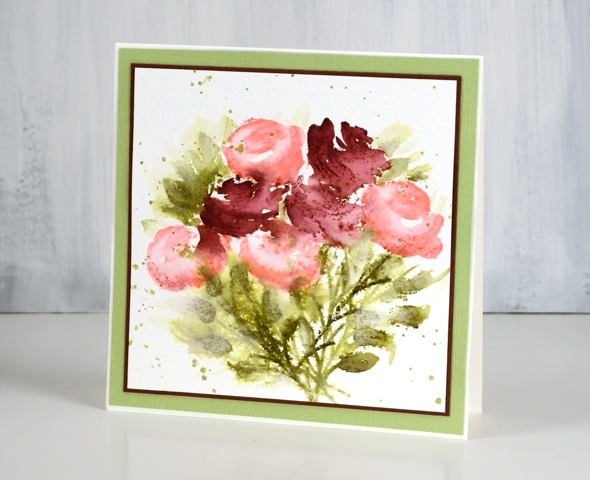 This second rose card I completed the same way but didn’t fling quite so much water around. 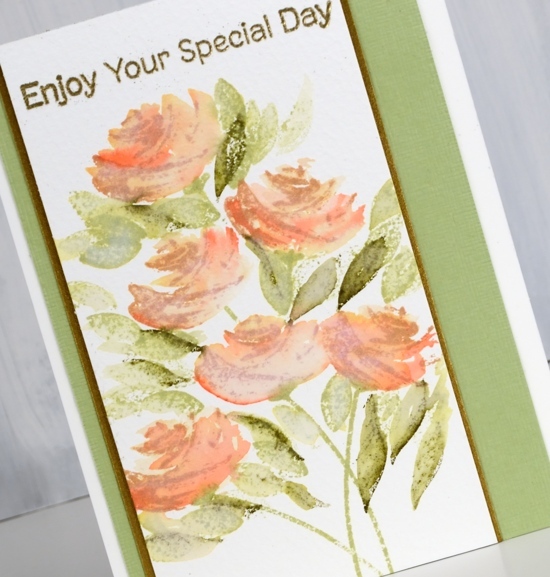 The inks were tea dye for the stamping of the rose (the second layer stamp) and abandoned coral for blending over the top. Once again the leaves and stems were forest moss and shabby shutters. 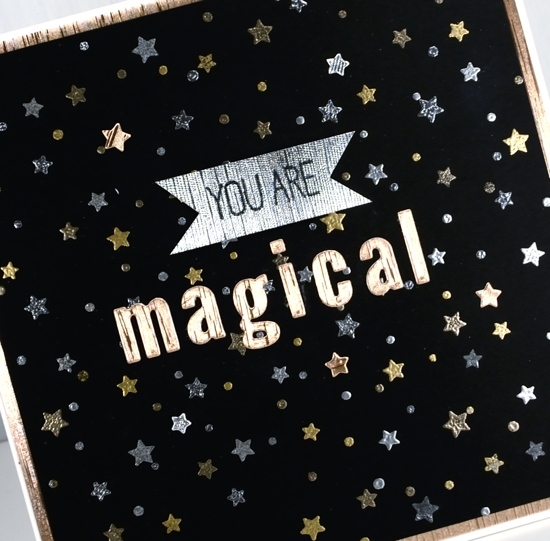 To make it just that little bit fancier I matted with a dark gold cardstock and embossed the sentiment with gold powder. 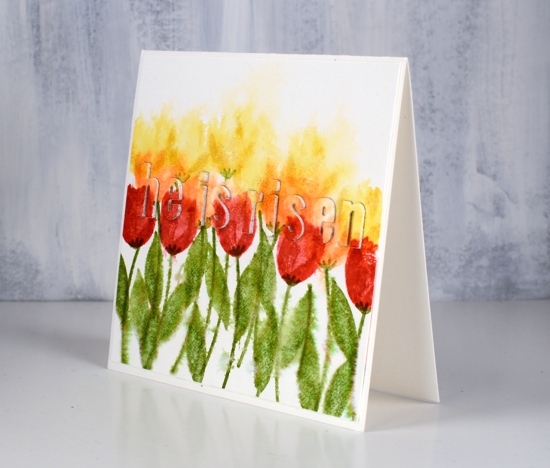 The technique described here is the one I used for the tulips in the previous post. 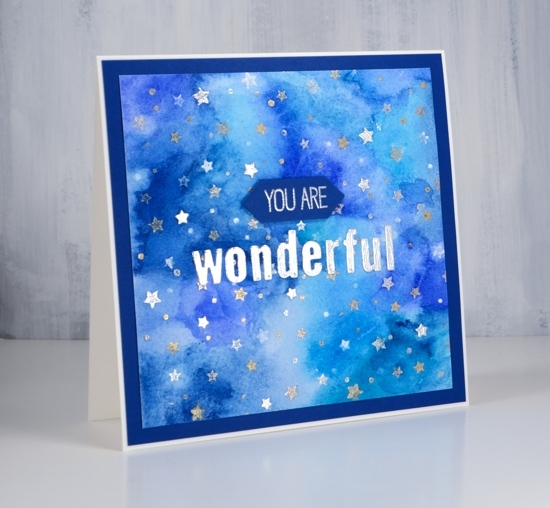 Layering stamps are very clever but I am happy to also have worked out a loose looking un-layered technique to try with them; you know I like blending everything with water! My Favorite Things is having a competition to find some Card Design Superstars so I thought I would throw a card into the ring. This one is created with stamps from the ‘Painted Prints’ stamp set. 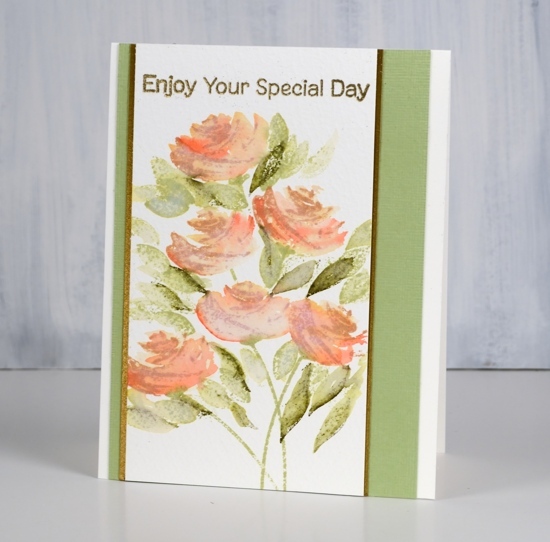 I have another post coming on Monday which explains my process using the rose stamps from the same set. I pulled this card out of that post so I could enter it in the ‘Clean & Simple’ category of the competition. 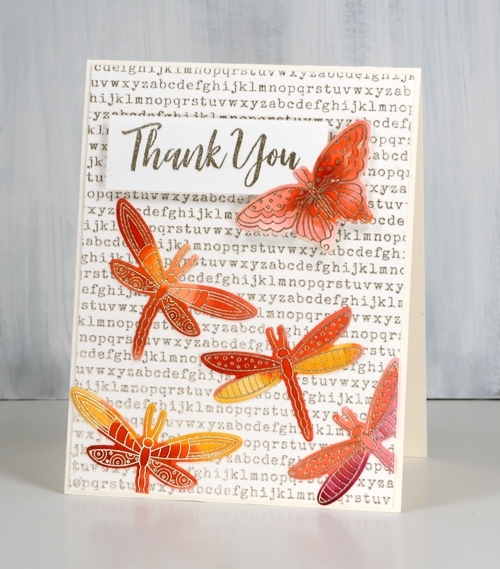 I used distress inks for all the flowers, leaves and stems then switched to versafine for the delightful sentiment from the ‘All About You’ set.